On the left side the learning curve of a naive Bayes classifier is shown for the digits dataset. Note that the training score and the cross-validation score are both not very good at the end. 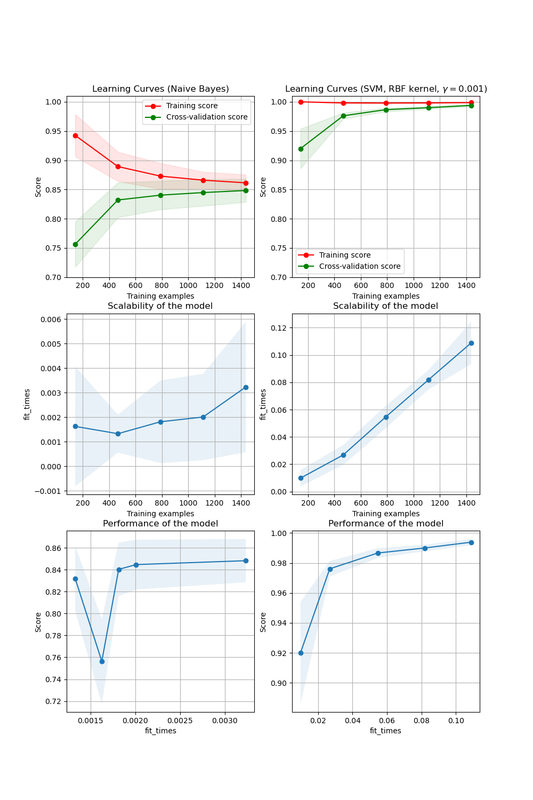 However, the shape of the curve can be found in more complex datasets very often: the training score is very high at the beginning and decreases and the cross-validation score is very low at the beginning and increases. On the right side we see the learning curve of an SVM with RBF kernel. We can see clearly that the training score is still around the maximum and the validation score could be increased with more training samples. Generate a simple plot of the test and training learning curve. Determines the cross-validation splitting strategy. - integer, to specify the number of folds. - An iterable yielding (train, test) splits as arrays of indices. or if ``y`` is neither binary nor multiclass, :class:`KFold` is used. cross-validators that can be used here. ``None`` means 1 unless in a :obj:`joblib.parallel_backend` context. by the selected validation method), i.e. it has to be within (0, 1]. Otherwise it is interpreted as absolute sizes of the training sets. be big enough to contain at least one sample from each class. title = "Learning Curves (Naive Bayes)"
# score curves, each time with 20% data randomly selected as a validation set. title = r"Learning Curves (SVM, RBF kernel, $\gamma=0.001$)"